Picture depicts a 1 pound wedge. 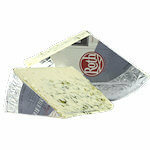 Crater Lake Blue is Rogue Creamery's most robust blue cheese. The cheese is hand-crafted as all the other cheeses from this artisan cheese company. 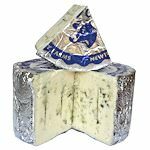 Crater Lake Blue is made with a complex blend of molds from Rogue Creamery and around the world, creating a vibrant blue-green color of the veins; a silky texture and bold, blue flavor. 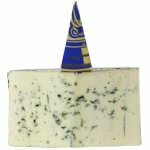 Crater Lake Blue, was awarded a gold medal by the 2004 American Cheese Society, a bronze medal in 2006 at the World Cheese Awards in the UK and most recently a 2nd place in the Blue Mold Cheeses Category at the American Cheese Society Competition in 2007. 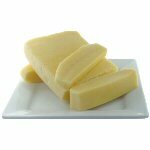 We cut and wrap this blue American Cheese in wedges of 8 ounces and 1 pound. 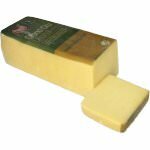 Ingredients: Pasteurized cow's milk, salt, enzymes, cheese culture, penicillium roqueforti.